Get ready to step into a time machine and allow Sara Barnard to transport you back to the Old American West with captivating scenery and a love so strong that it will withstand the test of the Civil War and separation. How long can a heart hold on before it breaks? Most women would carry on with their lives after being thrust into widowhood, but not Charlotte Adamsland. 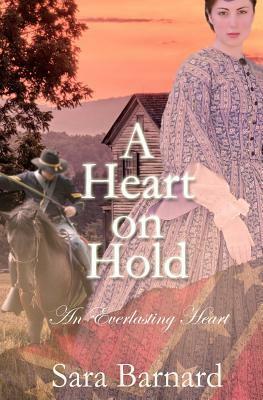 Upon learning that her husband, Captain Sanderson Redding, was killed in a botched escape from a Confederate prison in Illinois, she clings to his promise to return to her no matter what, and quickly heads north through a war-ravaged country with only her faith in God and her beloved horse to bring her beloved Sanderson home – one way or another. Thank you for having A Heart on Hold on your site Carmen! !